Yup, there's no place like being in your own house (even if it's a kitty condo). or on a nice soft, warm fleece pillow next to the heating vent, nothing beats being home. The storm did a lot of damage. Lookit this tree we can see right outside Mom's studio. It fell against the carport of the house next door. There are lots of broken trees everywhere. We are HOME!! We have 'lectricity!! This is so much better than that bathroom!!! Now I have to give the house a good once-over to make sure everything is OK. Mom and I are very happy to be home. It was 40F inside the house last night. It went down to 8F outside, so we know it got a lot colder. Thank you to all the beans and kitties who thought of us. We are thankful to have so many friends. These are my temporary digs at Auntie Karate's house. I'm camped out in the closet, lying on a beach towel. You can see my food dish and my water dish, my nice pillow and another towel. Just beyond the striped towel is my litter box and behind that is the human litterbox. There is nothing interesting to look at. I am bored. I want to go home. No kidding Millie! I want to go home too! The house was 47F when I went over yesterday, and I left the water running in the faucets so the pipes wouldn't freeze. 89,000 homes in NH are still without power, and the electric company estimates everybody's power will be restored by the end of the day on Monday. Geez, I hope we don't have to wait that long. I do not know why Beans call this Black Friday. But I know why I do. Mom put me in the cage and brought me to Auntie Karate's house. She says it is better for me than staying in our house without any electricity or any heat. I am stuck in the downstairs bathroom. (I am not in the cage.) Sure I have my own litterbox and my foods, and it is warm, but. We lost electricity just after midnight on Thursday. Sixty percent of homes in my town are without power. Statewide, over 111,000 homes are still without power (almost 200,000 homes were originally affected), and it is expected to take several days for power to be restored to all of them. I didn't want to leave Millie alone in a cold dark house, so I brought her to my sister's house, where I will be staying until the electricity is back at my own. Millie's none to pleased about it, but at least we are both safe and warm, and I do not have to worry about her. Lookit, the Turkey Dinner has moved to Auntie Karate's. I'm hiding out in a very warm spot. Yes we have snow. Lots of it. But we don't have electricity. So the fancy dinner Mom planned will not happen at our house. I am very thankful for a great many things in my life. For one thing, I have Life. Malcolm saved me from being killed by a car. That was a very long time ago. I am thankful to have a terrific Mom who understands that I own every part of the house we live in, even when I decide to take a baff on her newest quilts. Even if it's on the dining room table. Later the chairs will be filled with fambly and there will be lots of foods on the table. Oh. It snowed yesterday. Oh my Bast, how it snowed. So here I am on the kitty condo in the office at the front of the house. From here I can watch the neighbors walk by with their woofies. Mom's getting ready for Turkey day tomorrow. She has a cake of cheese in the hot-as-hell box and she has already cooked a dozen eggs. I have decided I do NOT want turkey and only want BEEF. Thankfully my Mom understands me and will oblige. We are supposed to get SNOW later today and tonight. I will show you pictures of what it looks like when it happens. Mom always thinks she's putting one over on me, but she forgets I am a Cat. If you do not understand, check out yesterday's post. As you can see, I didn't fall for her lame ploy. You will remember I never liked the very top spot on this kitty condo anyway. I do not care if the stuffed toy sits up there. I will knock it over when I am good and ready. Sometimes Mom tries to outsmart me. on the kitty condo in the office will make me want to investigate. She is hoping I will climb to the top and knock it over. Mom says this is a Very Big Deal. Why? Because she has never seen me nap with my back to the room. Usually I nap where I can simply open my eyes to see anybody coming. Mom got Jackson Galaxy's new book "Catification" and he says that a cat is really comfortable with her territory when she does what I am doing. Mom has been reading the book very closely and wants to set up a "cat superhighway" here. That's it, Mom. Don't stop. Keep going. I need my scritches like I need my stinky goodness. Thanks for giving me the attention I need. It's been colder than usual for this time of year, and the temperature isn't supposed to get above freezing ALL DAY. So yeah, I'm staying right here, in my heated cat cup. I am thinking that it is nice to have some time to think, and that I don't have to tell the world what I am thinking about. I am thinking it is fun to pretend to be thinking. As superior beings to humans, we Cats are always trying to teach our beleaguered caretakers. Alas, this is a difficult job. One [cat] would think that with a language consisting of millions of words, humans could at the very least understand one: "Meow." But it is not to be. However there are times when we see clear evidence of our influence, and it can be quite a surprise. You don't believe me? I show the following photograph of clothes Mom bought the other day. I have told her for years that I am always perfectly attired and do not need any extras to add to my already perfect wardrobe of tuxie furs. It looks like my lessons are finally beginning to sink in! Oh I love my kitty condo in the sun. It is good for so many things. 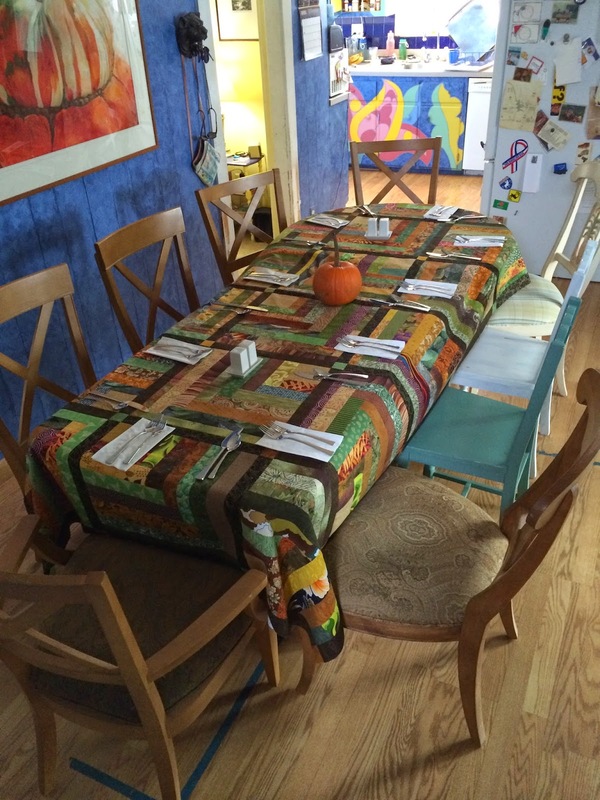 Mom finished a big quilt she'll use as a tablecloth on Turkey Day. Naturally I had to inspect every aspect of it. I am enjoying my sunny Saturday on my kitty condo. Yeah, okay, take a deep breath. I'm actually IN a box. Now get over it, because I didn't stay in there. I really like the new couch. I often sleep here at night. And certainly if Mom sits next to me. If you really want to get your Mom's attention, jump on the dining room table and give yourself a bath. If you're really good, you'll be all done before your Mom gets the flashy box. I was very disappointed on Saturday when the Electric Man came over to replace to light fixtures. He was not made of Ee-lek-tricity and did not have a cape or a mask. It really doesn't get any easier than this. Mom has got her usual weekend chores to do, but not me. For me it's sit here on my kitty condo in the sewing studio and watch bird and skwirl TV. Yup, I can already tell it's going to be a fine day. My Mom is silly. I think EVERY day, not just on Thursdays, so please don't worry that I only do my thinking on Thursdays. She just needs something to put up there, and the word "thinking" starts with "th" and so does the word "Thursday." Anyway. I have been continuing my investigations throughout the house. Yesterday Mom came home and found many of the cabinets and drawers open. 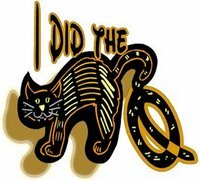 Yes, that was me. I get into as many cabinets and closets as I can to check out what's going on. For instance, Mom has been shopping at that big box hardware store. Not at the actual store, mind you. Their online version. Mom chooses what she wants, checks the little boxes and then when she goes to the real store later, they will have it all ready and waiting for her. I know this because an electric guy will be coming on Saturday to replace two light fixtures in the kitchen, and she needed to buy the second one before he got here. Mom has also ordered a new staple gun to replace the one that isn't working. You can read about that fiasco on her quilting blog. Me, I'm gonna go take a nap. There are lots of places in my new house to sit and look around. but this is my favorite. This is still a tent. and I am still hiding. It's rainy out, and grey and cold. I'm napping on the wing chair, hiding under this quilt. It's nice and warm here. Where else would I be?